Click the following questions to view our answers. What kind of school is Archbishop Williams? What type of student enrolls at Archbishop Williams High School? Is there an entrance test required? Where is Archbishop Williams located? Does a student need to be Catholic to attend Archbishop Williams? Is there a tutoring program? What does Archbishop Williams’ Campus Offer? 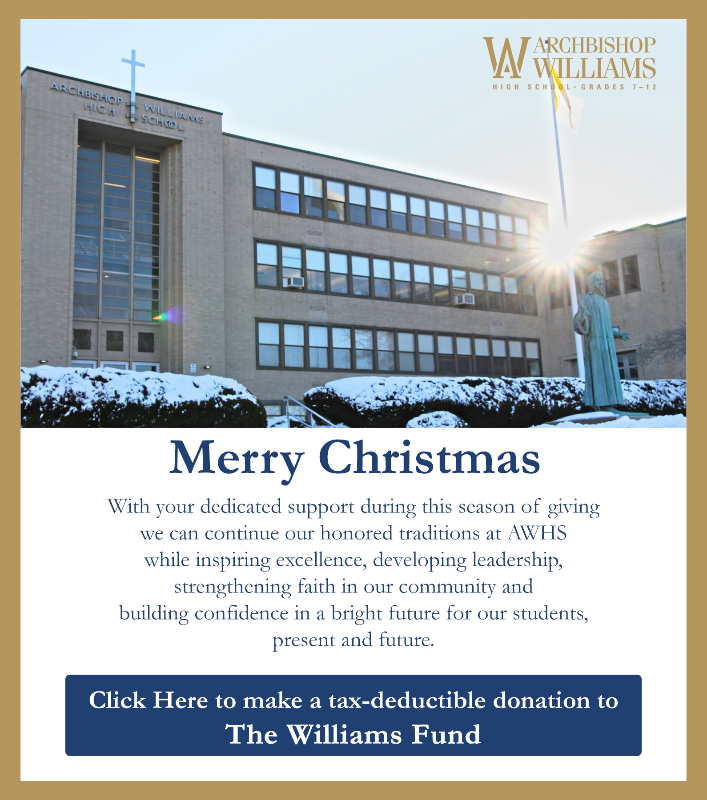 Archbishop Williams is a Catholic, independent, co-ed high school with a traditional college preparatory curriculum. It strives to develop the whole person. All of this is done in a Catholic community with an emphasis on Christian values. Archbishop Williams seeks to enroll students who display the talent and the motivation to perform in a strong college preparatory program. Our curriculum responds to a range of ability levels and our students are encouraged to go beyond their expectations. All students entering the Grade 9 are required to take the HSPT exam (Archdiocesan Catholic School Entrance Exam). Using the results of this exam, students will be considered for a Merit Scholarship. This exam is given at many locations throughout the Archdiocese, including our school. The fee is $30.00. Students entering Grades 7 or 8 are required to take the ISEE. Our hours are 7:40 am. to 2:20 pm. Students may arrive as early as 7:00 am and will be supervised in the cafeteria. Students may study after school in a supervised area from 3:00 –5:00 pm. Conveniently located at the junction of Rtes 3, 128 and 93, Archbishop Williams is very accessible. Many upperclassmen drive to school and the school helps to provide information to form car pools. In addition, Archbishop Williams is a stop on the MBTA bus route giving students access to the MBTA Red Line. The bus number is 230. No. As a Catholic high school, we seek to educate all our students in a Christian environment. Therefore, all students are asked to participate in our community liturgies and other spiritual events to whatever capacity they feel comfortable. Teachers are always available after school to help students achieve academic success. National Honor Society students also offer tutoring for students in all subjects. On average, our students are expected to do approximately two hours of homework nightly. Engaging students in homework is necessary to help them build up their time management skills, which is a key to success in college. Students learn to balance their homework along with activities, athletics, drama, service and other social events throughout the year. First period class officially begins at 7:47 am, followed by a 10-minute homeroom period. All classes are 53 minutes long with one long block lasting 70 minutes. We rotate classes on a seven-day schedule. There are three lunch blocks and each student will have 25 minutes for lunch. Hot lunch and an a la carte menu are offered daily for a minimal charge. Athletics and other activities take place in the afternoon and evenings depending upon the sport or activity. Archbishop Williams educates approximately 600 students in grades 7 - 12 with facilities that include 19 classrooms, a fine arts center (art & music) and four science labs, guidance offices, a chapel, cafeteria, Campus Ministry office, auditorium, gymnasium, amphitheater, work out facility and library. All classrooms use state of the art technology and students all use iPads that are fully integrated into the classroom curriculum. Nearby is an Administration building which holds admissions, advancement and administrative offices (Office of the President). Only a few blocks away is Memorial Field in Braintree, this award winning athletic facility is one of the best in the South Shore. Archbishop Williams also recently remodeled the former Convent of The Sisters of Charity of Nazareth to accommodate students with 9 new classrooms, a new conference/board room and office spaces for councilors, faculty and administration. This building also houses the fine arts center. We welcome you to come take a tour of our campus today!